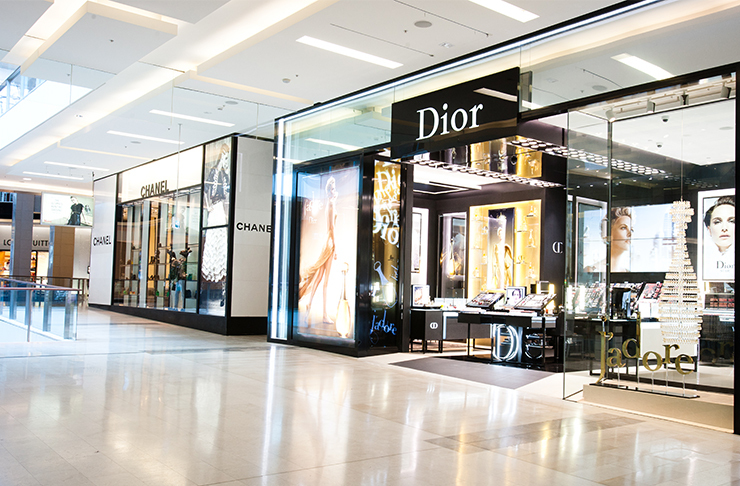 A glistening piece of Paris has arrived in Bondi Junction with the new Dior Perfume & Beauty Boutique. The first of its kind in Sydney, the Dior store features a fragrance consultation lounge, a skincare suite and makeup booths that ooze utter luxury. From the sparkling silver lounges to the interactive digital scent screens and a glass cabinet housing a $9500 gold-encrusted bottle of Dior (you know, because why not? ), step inside and experience pure Parisian indulgence. The iconic Dior Perfume & Beauty Boutique is nestled amongst Chanel, Tiffany & Co. and Louis Vuitton on the fourth floor, and is entirely devoted to Dior fragrances, makeup and skincare. Adorned in high gloss black, silver and gold shades, each Dior universe is clearly defined, emphasising its rich heritage. There are specialists to take care of your skin, others to match your scent, and finally those to prettify your face (pat, pat here, pat, pat there). You'll walk out looking and feeling like a million bucks. Okay, so what's on the menu? There are signature facials, flash makeup sessions, total makeovers and even private makeup tutorials, and that's just the face. There's also store exclusives including The Backstage Box, featuring the must-have products to create the looks straight off the runway, and The Dior Backstage Studio Lashes, to accentuate the length and thickness of your lashes. So, whether you are looking for an everyday look or a dramatic evening approach, Dior has got you sorted. Next, sit back and let the experts work their magic as they take you on an interactive olfactive journey through the extensive range of Dior fragrances. They will happily let you sample everything from J'adore to Miss Dior, Poison, Dior Addict and Dolce Vita to your heart's content. While in the skincare store, you will be taken on a sensorial experience, as professionals create a tailored skincare regime to suit your needs. The products are all created with natural plant-derived ingredients are guaranteed to leave your skin feeling refreshed and revitalised. For Dior fans out there, the boutique has everything a girl could dream of and is the place to shop Dior in Sydney . . . Rows upon rows of glimmering goodness. So, what are you waiting for? The House of Dior is also set to open two more boutiques before the end of the year, so keep your eyes peeled. TUL Note: Today's List Love post is proudly sponsored by Dior in Australia and endorsed by The Urban List. Our sponsored posts will never be a secret — the List Love seal will be stamped on any sponsored material you see on the site. Thank you for supporting the sponsors who make The Urban List possible.